A slow cooker simplifies your dinner menu by producing a hot meal without a lot of work. Pot roast works well in the slow cooker, also called a crock pot, to create a tender beef dish. 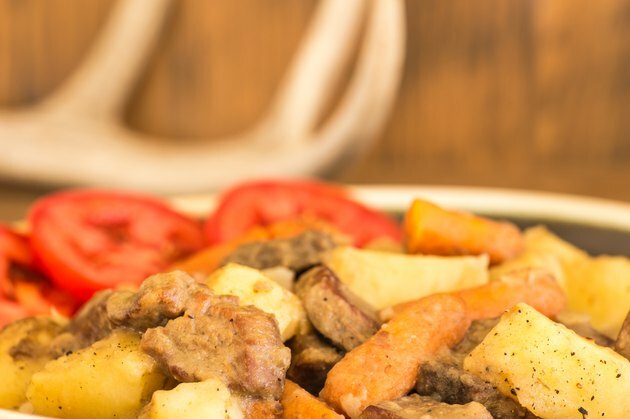 Potatoes and carrots cooked with the beef are a natural option as a side dish. Add other vegetables like mushrooms or onions to customize the meal, and choose seasonings based on the flavors you enjoy. Season the pot roast with salt and pepper. Drizzle the meat with Worcestershire sauce, soy sauce or steak sauce, depending on your taste preferences. Pour 3/4 cup of beef broth into the slow cooker. Stir in one pouch of powdered onion soup mix to completely dissolve it. Arrange 1 to 2 cups of washed baby carrots in the crock pot, depending on how many people you plan to serve. Add about a pound of red potatoes or peeled and chopped white potatoes. Add other vegetables, such as whole pearl onions, onion slices or mushrooms. Place the seasoned pot roast on top of the bed of vegetables. Cook the roast and vegetables at least six hours on the high setting or eight hours on the low setting. Pour the juices over the roast two or three times during the cooking period, if desired, to keep it moist. Pull the roast out of the crock pot and slice the meat. Scoop out the vegetables and place them in a serving dish. Top the roast and vegetables with the leftover juice before serving.